Lyme Regis Museum01297 443370work MuseumThere really is something to delight and inspire everyone at Lyme Regis Museum. Enjoying a stunning seafront location on the world famous Jurassic Coast with fantastic views over Lyme Bay, you’ll find fossils galore in the new interactive geology gallery, a new learning centre (great fun for families), local history, famous writers, fossil hunting walks and of course Lyme’s most famous fossil hunter, Mary Anning. Built on the site of her former home, here you will discover the story of the remarkable and important contribution Mary Anning made to the development of modern scientific thought – against all the odds. complete with beautiful spiral staircase. With a full calendar of events on offer plus special family events in school holidays, there’s lots going on in this lively museum. Why not combine your visit with one of our fossil walks, or go and explore the town with its lovely beach and famous Cobb – it makes for a wonderful day out! Why choose our fossil walks? Well, not only do they last a full 3 hours, but our guides are expert geologists known for their friendly and helpful approach and are full of passion for all things fossil. Our walks really are top notch – check us out on Trip Advisor and you’ll see that plenty of visitors agree! In fact, we’ve won the Trip Advisor Certificate of Excellence 3 years in a row! Come and see for yourself why we, and thousands of our visitors, are so passionate about this lovely museum, its collections and walks. There really is something to delight and inspire everyone at Lyme Regis Museum. Enjoying a stunning seafront location on the world famous Jurassic Coast with fantastic views over Lyme Bay, you’ll find fossils galore in the new interactive geology gallery, a new learning centre (great fun for families), local history, famous writers, fossil hunting walks and of course Lyme’s most famous fossil hunter, Mary Anning. 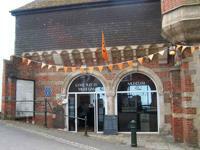 Lyme Regis Museum - what will you discover?